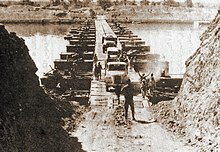 The Egyptian army occupied the eastern coast of the Suez Canal with the exception of the Israeli crossing point near Deversoir. The Egyptian army had advanced 12 kilometers into Sinai. The Israeli army occupied sixteen hundred square kilometers of territory on the southwestern coast of the Suez Canal, within 101 km from Cairo. The Yom Kippur War (also known as the Ramadan War and the October War) was a war between Israel and a group of Arab countries led by Egypt and Syria. The war took place from October 6-24, 1973. The war began on the Jewish festival of Yom Kippur in 1973, and it happened during the Muslim month of Ramadan. The attack by Egypt and Syria was a surprise to Israel after Israel conquered the Sinai peninsula and the Golan Heights from Egypt in 1967. Egypt's army entered the Sinai Peninsula to retrieve their land from Israel. On the Egyptian front, Israel's attacks against Syria had served as a 'distraction' against the Egyptian offense. This allowed the Egyptian army to dig deeper into Sinai, around 12 km, an extra 2 km to the original 10 km plan. Israel feared a massive military defeat and so called on America for aid. Initially, America refused so Israel threatened to use its nuclear weapons, this threat was enough to persuade President Richard Nixon to send aid to Israel. America conducted Operation Nickel Grass, which gave Israel a resupply of 20 tons of military equipment and ammunition. This proved vital to Israel and it allowed Israel to continue fighting and claim a victory. Henry Kissinger, United State of Secretary at the time, later said to Israel, "America saved you during the Yom Kippur War." ↑ ""Anwar Sadat and Yom Kippur War"" (PDF). ↑ ""Who Won the October War"". ↑ 3.0 3.1 "The 1973 October War: The Egyptian Perspective". www.globalsecurity.org. ↑ Oren, Amir (2 November 2013). "Kissinger Wants Israel to Know: The U.S. Saved You During the 1973 War" – via Haaretz. This page was last changed on 20 March 2019, at 18:20.